Please visit the Monona Farmers’ Market website to see the full job description. Applications are due August 30th, 2014. This is a part-time position. Tom Vilsack, Agriculture Secretary of the United States Department of Agriculture, has announced August 3-9 to be “National Farmers’ Market Week.” This will be the 15th National Farmers’ Market Week to celebrate the thousands of farmers’ markets, new and old, that set up in parking lots, closed streets, and other public spaces throughout the nation. You can read Secretary Vilsack’s official proclamation on the USDA website. Local recognition of National Farmers’ Market Week will feature a visit from the USDA Agriculture Marketing Services Administrator Anne Alonzo to the Dane County Farmers’ Market on Saturday, August 2nd. Her tour of the market will be followed by remarks at 10am on the steps of the State Street entrance to the Capitol. According to the DCFM newsletter, Mayor Paul Soglin is expected to be in attendance. SNAP/EBT access at local farmers’ markets is a vital piece of what makes these markets vibrant community and commercial spaces. We hope this year’s celebration of National Farmers’ Market Week will recognize and renew the USDA’s commitment to supporting EBT services at farmers’ markets. The full press release regarding the National Farmers’ Market Week announcement and other events can be found on the USDA website. Check out the other farmers’ markets in the Madison area that also accept EBT as part of YOUR celebration of National Farmers’ Market Week. 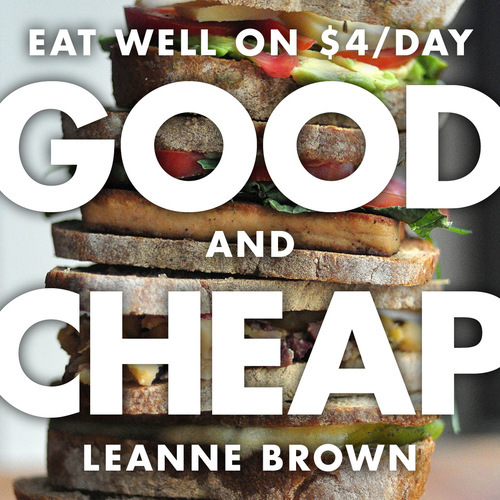 Student author Leanne Brown wrote the “Good and Cheap: Eat Well on $4 a Day” cookbook to highlight the opportunities to eat delicious meals on a budget, specifically geared towards those receiving and living off of their SNAP benefits. The working-copy of the PDF has been available online for a while now, it was added to our “Recipe Links” section here at Farm Fresh for All back in early May. Since then, Leanne has launched a Kickstarter campaign to also make the book available in print, and her campaign has exploded! I made my “get one, give one” donation on June 9th when about $15,000 had already been donated. Today, her campaign has raised over $85,000! Her effort to make as many copies of “Good and Cheap” available for free and at low cost to organizations has been astounding, and she keeps upping the ante as more people make donations. Currently, she is making 14,000 copies available to non-profits at $4 a piece and will print 3,800 to be donated to organizations to distribute for free to folks who could use this resource (organizations can apply here). The more people who continue to donate, the more copies she will be able to make available to individuals and organizations. If you haven’t taken a look yet, please visit the Kickstarter page to download the PDF, check out the updates, and consider a donation to spread the delicious love. Leanne, many thanks for your efforts and generosity! Oh yeah, wondering if the book is worth the hype? I have tested out a few of the recipes and generally found them delicious (though I would recommend adding some canned or fresh tomatoes to your cooking liquid for the dal for bonus depth and acidity). Take a look at the PDF and try a few before you decide! Graze Restaurant and Rush River Brewing Company partnered to host a Beer Dinner on Sunday, June 22. About 80 people attended this $50 per person dinner and proceeds from the meal will benefit the FoodShare Program at the Dane County Farmers’ Market. Thank you, Graze staff, for working to help sustain programming that promotes local foods access and affordable, fresh options! New EBT Market at Brittingham Park! The Brittingham Park Farmers’ Market will open for business on Tuesday, June 3rd. Come on down to the Brittingham Park Pavilion on West Washington Avenue from 3pm to 6pm for their kickoff event! Guest chefs will be joining the market vendors each week to do special demonstrations and give out tasty samples with the recipe cards. Something unique about this farmers’ market will be their weekly “Featured Ingredient” emphasized in the cooking demo and available for purchase at the market. BPFM has been authorized to accept EBT and should be ready to accept benefits on opening day. Find them on Facebook to learn more throughout the season! Also see this Isthmus Daily Page write-up on the new market! That’s right, SNAP/EBT benefits can be used to purchase food-producing plants and seeds. That includes tomato starts, cilantro plants, pumpkin seeds; whatever you want to eat and have the green thumb to grow. If you’re new to gardening, ask your market farmer about low-maintenance crops or check out some resources on container gardening to start small. You can also call or email the Horticulture Hotline operated by Master Gardener Volunteers from Dane County UW-Extension at (608) 224-3721 or horticulture@countyofdane.com with questions as you get started and throughout the season. UW Extension also has some resources pertaining to container gardening available on their Learning Store website. Fair warning, usually your SNAP benefits can only be spent this way at farmers’ markets or grocery stores that accept EBT– your local greenhouse or online seed company cannot be authorized to accept SNAP because they do not sell the required categories or allotments of “staple foods.” All the more reason to check out the available varieties at your local farmers’ market this spring! And hey, if you’re interested in helping to spread the word, the SNAP Gardens initiative provides free or low cost promotional materials you can post up at community gardens, farmers’ markets, or grocery stores. Happy planting! Partner Shares Program Accepting Applications for Subsidized CSA Shares! The Partner Shares program of the FairShare CSA Coalition offers financial assistance to low-income households to purchase Community Supported Agriculture (CSA) vegetable shares. CSA provides the customer with weekly, bi-weekly, or monthly boxes of the freshest local produce available, directly from your CSA farmer. SNAP/FoodShare benefits can be used to purchase CSA shares. Applications are accepted on a first come, first served basis until April 14th. Check out their website for more information or to apply! The USDA recently announced a new partnership for linking up farmers’ markets that do not currently accept EBT with the technology and some financial support to do so. If you are looking to bring EBT access to a farmers’ market near you, please read below to learn more about the MarketLink program! “America’s farmers’ markets are a great source of fresh fruits and vegetables and other healthy foods, and at USDA’s Food and Nutrition Service (FNS), we’ve made it a priority to expand healthy food access through farmers’ markets to those participating in the Supplemental Nutrition Assistance Program (SNAP). It’s a win-win situation because, for farmers markets, the ability to accept SNAP benefits is a great way to build their customer base, which helps generate more sales and nourish the economy in our rural communities.